Big news! In case you missed our previous blog post, Tinkering School is partnering with the Boys & Girls Club of San Francisco to bring our after school tinkering programs to their young members! We couldn't be more excited to be working with the B&GC Willie Mays clubhouse (check out their blog here) and the B&GC Mission clubhouse. This week we met our Mission tinkerers for the first time and while we munched on snacks we learned each other's names and what everyone's favorite kind of sandwich was (lots of chicken salad sandwich fans in the house!) With this important business behind us, we talked about our four Tinkering School goals: collaborate and make friends, make mistakes and learn from them, try harder than usual, and build something bigger than ourselves. We also created some group agreements around how we will safely use the tools and treat each other with respect while we work together as a team. With these goals and agreements guiding our time together, we're bound for some epic tinkering! Next up it was time for tool training! We split into three groups and cycled between stations learning how to use clamps, drills and the chop saw. Drills are always a huge favorite with tinkerers and this crew definitely thought so too. The kids learned all the different speed and direction settings, how to change drill/screw bits, how to choose what length screws to use, and much more. And they practiced their new skills by making giant frames. Alberto and Henry demonstrating picture perfect technique and teamwork! And last but definitely not least - the chopsaw!!! 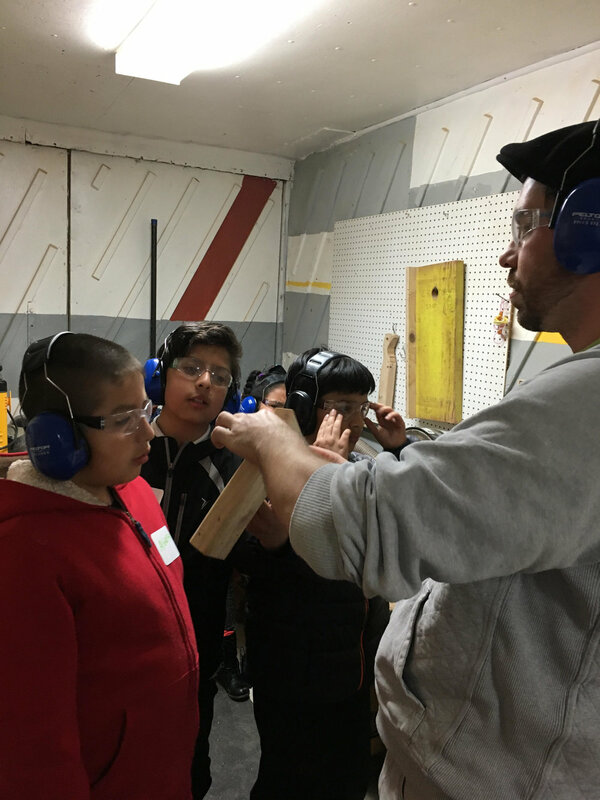 With a little healthy fear and respect, our young tinkerers learned how to safely cut 2x3 pieces of lumber. The important take away - keep all hands and appendages out of the blood bubble (the unsafe area within 10 inches or so to the left, right, and front of the saw blade). They did great and I'm happy to report they left with all fingers intact as well as some wood block souvenirs. This week was all about tool training and setting goals for our time together. Next week we'll find out what we'll be building and start designing and constructing our masterpiece! Stay tuned each week to see our progress!